An ATV is more than a simple mean of transportation, as it can help you easily reach your destination without worrying about being stuck in traffic. It is also the perfect ride to take on your offroad trips or on the mountain slopes in the winter time. Moreover, since it is smaller than a regular four-wheel vehicle, you’ll be able to park it anywhere you want. You don’t have to be 18 years old to legally ride an ATV. Depending on its motor power and state regulations, you can learn how to ride it as young as 12-14 years old. However, properly looking after your ride could prove a difficult task, especially if you plan on using it in the winter time. Here are some tips that can help you prepare your ATV for a few months of fun, snow, and low temperatures. First, you need to make sure your ATV starts no matter the temperatures outside. In the winter time, petroleum-based oils tend to thicken easier, and this could become a problem for your engine. The thinner the oil is, the easier it will be to start it in the winter temperatures. Therefore, we suggest opting for synthetic oils instead. After you make sure your engine starts, it is time to look after your tires. Change them with appropriate winter tires that will keep you safer no matter the weather conditions. Bear in mind that ice and snow make the roads slippery and harder to control. The lugs on regular winter tires are placed further apart to allow you to get rid of the snow and keep digging forward. It may be a good idea to change the size of your tires and switch to taller ones. This way you will get more clearance and will be able to navigate through the snow easier. Keep in mind that your safety is at risk so you shouldn’t consider price as a decisive factor. Second-hand or used tires are only an option if you don’t plan on using your ATV more than a few times during the snow season. ATVs could prove handy vehicles in the winter time, especially if you want to clean your front lawn or the alley up to your garage. A plow is the most useful accessory to add on a four-wheeled vehicle in the winter time because it can help you clean the snow from the driveway in just a matter of minutes. This way you will always be in time for work and will prevent backaches and hand fatigue caused by regular shovels. 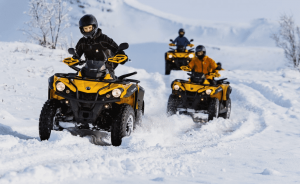 If cold temperatures are not among your favorites but you still want to enjoy a safe ride on your ATV, an additional cab could prove the most reliable alternative. Cabs are easy to mount on any type of vehicle, and they come in various sizes and shapes. They are made of reinforced canvas, similar to the one used for tents, and will keep you insulated and warm. Any regular ATV could turn into an enchanted carriage with the help of these useful inventions. And if a cab is not enough for you, you can opt for an additional cab heater that can be hooked up to your vehicle’s electrical system to provide the optimum temperature. A heater is the perfect solution for children or those who prefer the warmer months of the year. There isn’t anything worse than being stuck in the middle of nowhere in freezing temperatures with nothing to get you back home safe. If you want to prevent your ATV from pulling out a bad surprise, you need to make sure its battery is always charged and functional. Keep in mind that low temperatures will slowly drain your battery even if you’re not using it, so you’ll end up ruining it unless you take action. Remember always to keep the battery terminals clean and free of corrosion. You can also opt for a trickle charger to make sure you never run out of juice. Condensation naturally occurs when you take your four-wheeler from a cold environment to a warm one. If water is formed in your fuel system, it may prevent your engine from working. Keep your gas line out of the freezing zone by purchasing a fuel stabilizer. Another tip to keep your ATV running regardless of the temperatures outside is to have your gas tank full to prevent condensation. 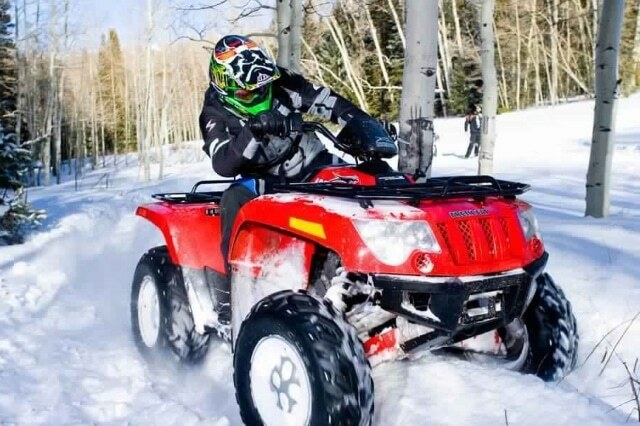 Your ATV isn’t the only one that should benefit from special treatment in the winter time. Try to keep yourself warm by purchasing adequate winter equipment. A high-quality pair of winter gloves will prevent your hands from freezing on the handle. Handguards can shield your hands from the wind, while heated grips are perfect for those who cannot ride using regular gloves. Don’t’ forget to also invest in some reliable winter off-road ATV helmets to keep your head and ears safe from the cold temperatures. A full face mask or a longer and warmer scarf will also help you focus on the road better. 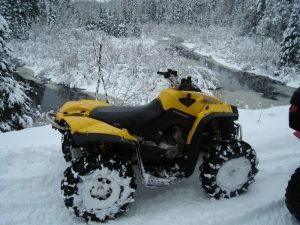 Snow and heavy rains can damage your ATV permanently unless you take good care of it. Winter is your ride’s number one enemy because it promotes rusting and corrosion. You can prolong its life and even use the opportunity to inspect for damage by washing it after each use and applying special sprays on its metal parts to keep rust away. Consider investing in a cover too, especially if you don’t use your ATV too often. This will shelter it from snow, rain, high humidity, dust, dirt, debris, and pests that might deteriorate it in time.